The water starts to recede and the events start to blend together… so here’s a recap. Roads to and from Long Lake had limited vehicular traffic for three days. The water has started to recede. 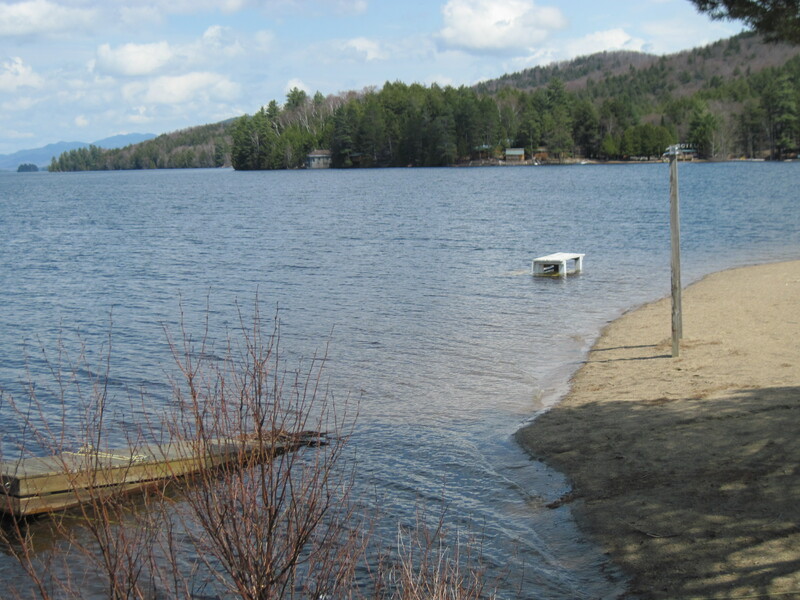 April 30, 2011, Long Lake NY. 7:00am. 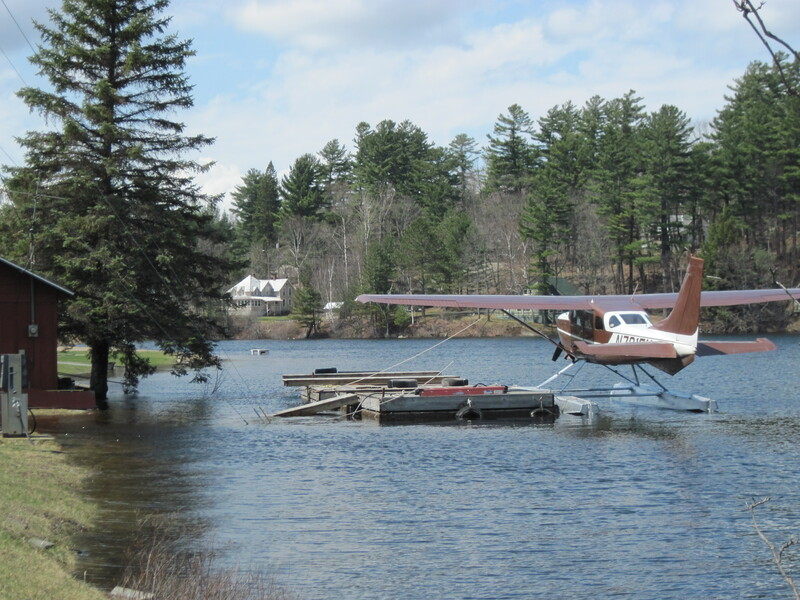 This morning at 7am, near the Adirondack Hotel and Helms Seaplane Base along NYS Route 30, the flood water had gone back down to levels seen on Thursday afternoon. NYS DOT still has the road blocked to truck traffic between Blue Mt. and Long Lake across the bridge. Passenger cars and trucks are still getting thru at their own risk. The water was down and will continue to recede throughout the day. There is a log truck parked in town, currently awaiting permission to travel north to Tupper Lake once the NYS DOT gives clearance. Special thanks to the Hamilton County Highway, Long Lake and Indian Lake DOT and the Long Lake Highway Department for manning the roads on 24 hour shifts to keep truck traffic routed through Newcomb. We look forward to having a reunion with both sides of town very soon. May 1, Fiddle Jam is postponed until further notice. With deep regret the Long Lake Parks and Rec Department has postponed the Spring Blossom Fiddle Jam slated for Sunday, May 1st. Unfortunately due to a State of Emergency by the Town of Long Lake it was recommended to reschedule the event for another time when all roads are open to full traffic. At this time Route 30 from Blue Mt. Lake to Long Lake has limited vehicular traffic. No tractor trailers or log trucks are permitted from Blue Mt. Lake to Long Lake. All truck traffic is being diverted to Newcomb on Route 28N as trucks are not allowed through downtown Long Lake over the Long Lake Bridge on Route 30 until further notice. Passenger vehicles have been getting through at their own risk. We will reschedule with Frank Orsini and The Whippersnappers and Donnie Perkins and the Family Band for a future date. We apologize for any inconvenience. Always call ahead. All events are subject to change without notice. Day Two of the 100 year flood. 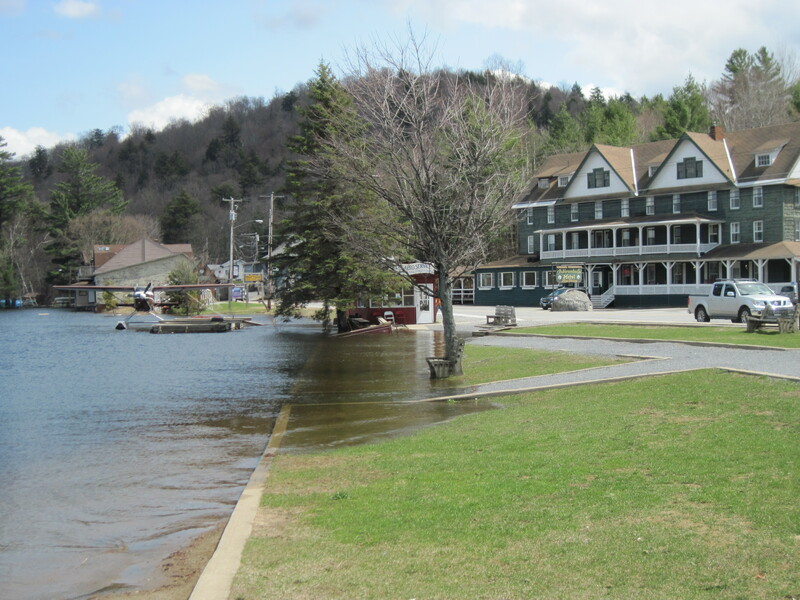 The water at Route 30 in Front of the historic Adirondack Hotel measured 18 inches at the deepest part of the road. It was over the second step at the hotel. Beaver activity was spotted in Jennings Park Pond. A park bench from the Long Lake beach was floating down river. Photos and reports have been filing in from around the area. Long Lake Central School is closed. Some re-caps for folks – Newcomb, Long Lake and Johnsburg and Indian Lake Schools are closed; Rt 28 between North Creek and Indian lake is closed, State Rt 28N in Newcomb is closed by the gas station and Lake Harris. Route 30 in Sabeal is open in one lane for traffic between Sabeal and Speculator. Route 30 between the Adk Hotel and Long Lake bridge is closed and covered with 18 inches of water, but larger trucks are passing through at their own risk. There is a detour for cars only on Route 30/28N in Long Lake in Deerland on Emerson Road. The Town of Long Lake and the Fire Department and Rescue Squad have equipment on both sides of the bridge so the town has safety response in place in the event of emergencies. Thank you to all volunteers, the Long Lake Highway Crew and NYS DOT for coordinating these efforts. Check out the view from the porch of the Adirondack Hotel. While we clearly are laughing it up, it is not lost on any of us the damage the flood waters have caused. Our thoughts go out to all the property owners of Long Lake. It’s only April 28th. We have plenty of time to dry out. Long time resident of 93 years has never seen the water this high. The NYS DOT will be closing route 30 dividing the town of Long Lake in two. Look for the road to close at 1pm on Thursday, April 28th. The Town of Long Lake at 1pm will declaring a State of emergency due to the conditions of the road between the Adirondack Hotel and the Long Lake Town Bridge. The Long Lake Fire Department has a pumper at the Adirondack Hotel and is attempting to divert water from the historic building into Jennings Park Pond which has seen record levels of water. Long Lake Central School released the students early. Dave Lamos, proprietor of Northern Borne Store, was concerned about the peak level of water predicted from all the rain and run-off. He was unsure if he should clear out and move his inventory to higher ground. A large generator was in place pumping water out of his submerged basement. The level of the water was two feet below the first floor at 11:30am. In the midst of all the emergency chaos the Red Cross is at the Long Lake Town Hall for the spring Blood Drive which opened at noon today, April 28th. If you are able to reach the Long Lake Town Hall the Red Cross will appreciate your time and donation. 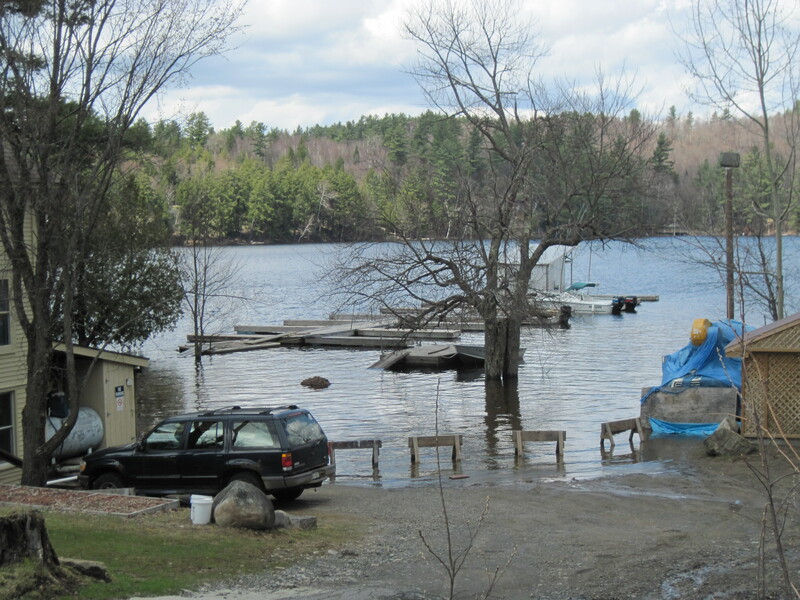 “It’s the highest water I’ve ever seen,” exclaimed longtime resident and Long Lake Marina owner Terry Folmsbee. It’s no joke. The water continues to rise and more rain is predicted in the next two days. Route 30 near Quackenbush’s Long View Lodge and Emerson Road is now flooded and DOT workers are out managing one lane of traffic. A storm system rocking over 40 states in the US didn’t miss Long Lake, NY. Backyard streams became rivers, backyards became ponds. Docks, styrofoam, winter debris, logs, set of stairs, canoes and even a porch swing were in the path of destruction and floating down the widening of the Raquette River on Wednesday afternoon. 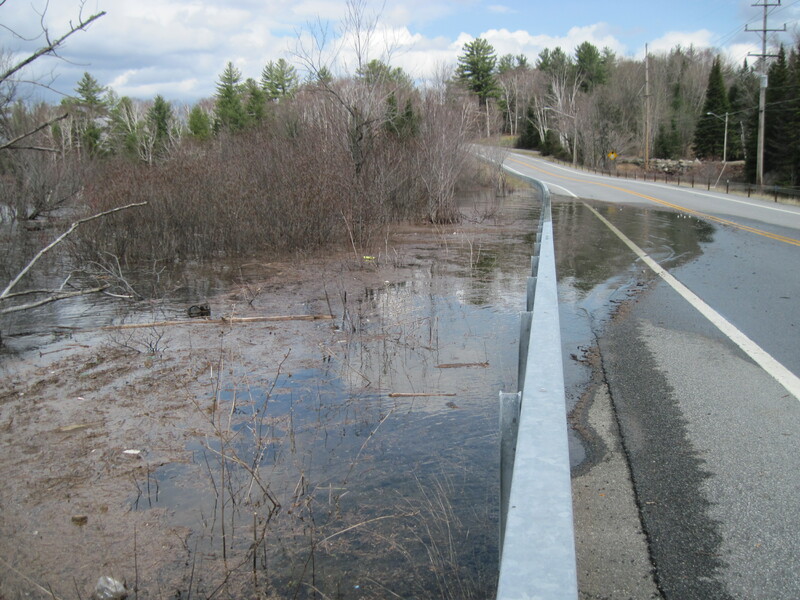 At 1pm on Wednesday, April 27th water was seeping across NY State Route 30 in the Deerland section and Emerson Road. 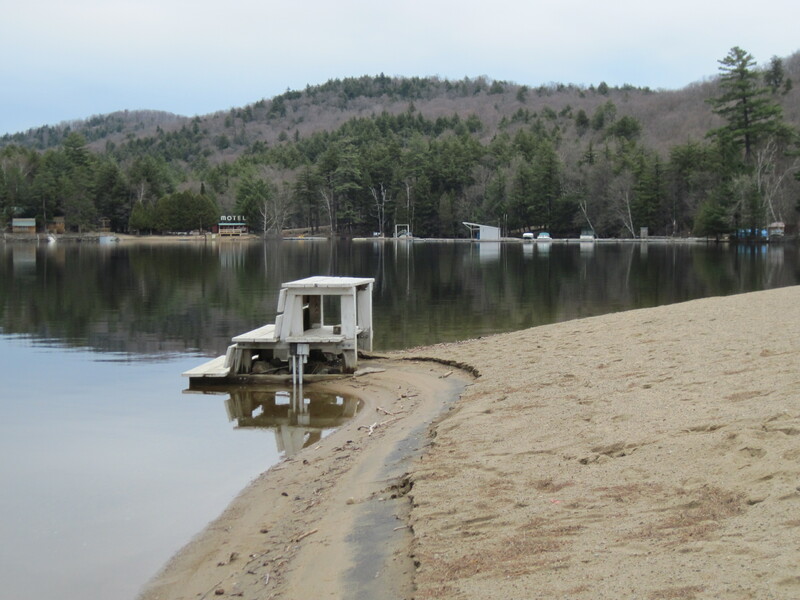 The Long Lake Town Beach has seen record high levels of water, the lifeguard stand yesterday was partially submerged and today was barely peaking out. Water at Helms Aeroservice reached the edge of the building. Tom Helms, wearing waders, carefully navigated to his dock to move a ramp and was picking items up off the floor in the office to prevent water damage. 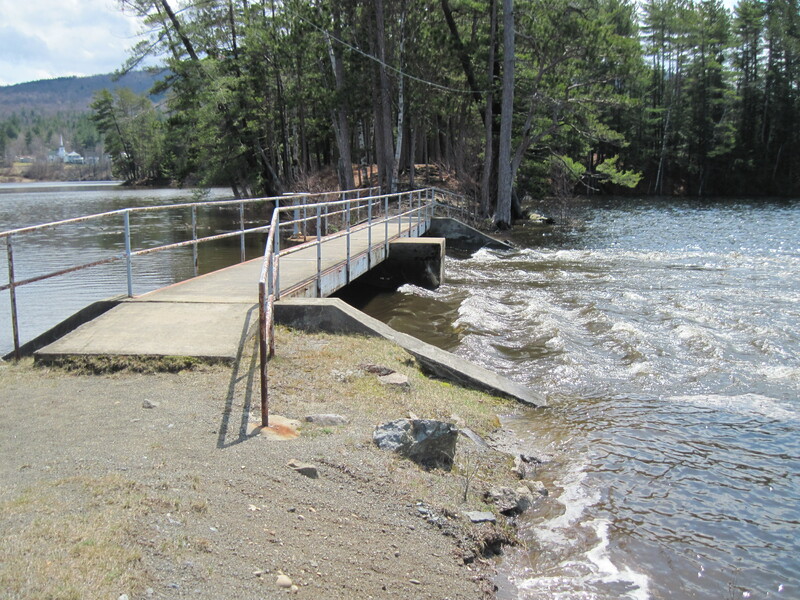 The Long Lake Spillway, built during the by the Civilian Conservation Corp as part of the New Deal back in the early 1930’s usually boasts a steep height of five to six feet drop to the lake. Today it is level with the lake. Forecast tonight calls for more rain at a rate of two inches per hour. Hard to believe. The sun is out, it’s humid and best of all… NO BUGS! On May 1, 2011 at the Long Lake Town Hall, 1204 Main Street, Long Lake NY, Frank Orsini and The Whippersnappers will join Donnie Perkins and the Family Band for the 20th Annual Spring Blossom Fiddle Jamboree in Long Lake, NY. Donnie Perkins and the Family Band are seasoned vets of the Long Lake Fiddle Jam and return having performed on the Long Lake stage for many years. Over the years, Don’s playing has evolved to include more modern styles such as bluegrass and country-western. All the while, though, he has continued to carry the torch for the old-time fiddle music he grew up with. Now based in Plattsburgh , Don Perkins has won numerous fiddle contests, recorded several LPs and CD’s and published at least one book on fiddling. He is widely regarded as an outstanding New York State fiddler. Long Lake’s Fiddle Jam is a celebration for all ages and all levels of experience helping preserve, and promote old time fiddling. No auditions are required, no competition, just good times, toe-tapping, spirit lifting music. Fiddlers arrive at the Long Lake Town Hall on Route 30 by noon on May 1st to reserve a slot to play two songs with our backup band or with your own back up musicians. It’s an informal gathering of friends, old and new in a non-competitive atmosphere. Get there early to sign up. Admission is $7 for Adults, $4 for kids 10-16 and children under 10 are free. The Long Lake Ladies Auxiliary will be selling lunch. Realtor in the Long Lake area for over 8 years. Making dreams come true for whatever property you desire. Call, email or drop by the office located across from the Town Beach in Long Lake on route 30. Donna has lived in Long Lake year-round for over 14 years after falling in love with the Adirondacks and the people. Donna awaits your inquiries, and she’s available seven days a week. Call Donna today and she’ll be diligent to find the right fit. Or just contact her and she can put you on automatic notification by email of new listings and price range in the Long Lake, Newcomb, Indian Lake, Blue Mountain Lake and Raquette Lake area. Donna knows the central Adirondacks and she’ll match you with the property of your dreams. Not all agents or brokers are REALTORS® — there is a difference. Only those who are members of the NATIONAL ASSOCIATION OF REALTORS® are properly called REALTORS who follow high standards and are committed to treating you fairly and honestly. REALTORS subscribe to a strict Code of Ethics, which in many cases goes beyond state law. A REALTOR® shares information on the homes they are marketing, through a Multiple Listing Service (MLS). Working with a REALTOR® who belongs to an MLS will give you access to the greatest number of homes and prospective Buyers. Go to Gillis Realty for my personal profile and to read testimonials from my satisfied buyer and seller clients.